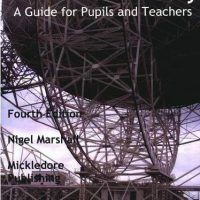 It is an unfortunate fact that the Maths offered at GCSE level is not sufficient to meet the needs of A-Level or AS Level Physics. Quantities; base and derived units (SI and non-SI); multiples and sub-multiples; writing conventions for quantities and units; scalars and vectors; suvat equations. Significant figures; standard form numbers; fool-proof calculations. Ratios, fractions and percentages; correct use of calculators. Estimating the magnitudes of quantities; rules for indexed numbers; order-of-magnitude calculations. Simple probability in the context of radioactive decay. Calculation of mean and range; uncertainty and percentage uncertainty for a series of measurements; estimation of uncertainty in a single measurement; combining uncertainties. 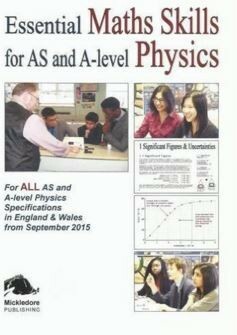 Common symbols; use of algebra to change the subject of formulae; quadratic equations and their solutions. Tables of data; graph plotting using sensible scales and correct labelling; linear graphs. Determination of gradient and intercept for linear and non-linear graphs; significance of gradients and intercepts; determination of areas under graphs; significance of areas. Pythagoras’ Theorem; use of sin, cos and tan functions in right-angled triangles; calculations of surface areas and volumes of regular solids; radians and degrees; small-angle approximations. Co-linear and co-planar vectors; determination of resultant using geometry (for perpendicular vectors) and scale drawings; components of co-planar vectors and their use in solving problems. Concept of logarithms; bases; logarithmic scales with common examples; rules for logarithms. Log-log graphs and their use to prove power-law relationships; use to determination of unknown power. Sine and cosine curves revisited; graphical modelling of relationships (including sine squared, exponential decay). Nature of exponential decay; natural (base-e) logarithms; graphs involving natural logarithms in exponential decay. 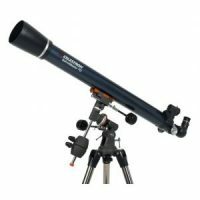 GCSE (9-1) Astronomy bundle special including telescope!